I am looking for clips, notes, manuscripts or anything related to the latest tour “The gods aren’t angry” does anyone know where to get anything from that tour? Hey Johnny5, I was just looking for the same thing, i added a couple links with good notes. thanks for coming by! This is great. we went to listen to bell last night in seattle and i was stunned…so good. what a great teacher! thanks for these links. i hope you keep updating (in other words, do the hard work for the rest of us!). we are hoping he comes to canada next tour. do you know where you can get the old mars hill messages? i.e. the leviticus study and the old series listed on the sermon archieve. That would be sweet to find that first year of services, but I wonder if the only place would be to actually buy them from Mars Hill…or to find someone that has a secret stash of all the Mars Hill teachings somewhere. someone please do some research on finding those teachings. i have looked for while online with not many results. let me know what you find. Great list Lon – thanks. Do you know the name of the track on the Everything is spiritual dvd? Rob Bell is a fan of the Icelandic band Sigur Rós; he used their song Takk in his Everything is Spiritual tour… could that be the one on the dvd? No, I checked, and It’s not. I even asked Rob bell at the God’s aren’t angry tour and he didn’t know, so I think it’s just going to take someone recognizing the song. Thanks though. Darren, thanks so much for sharing the resource. I had never heard of it… Looks a little pricey, but i guess it is 4 dvd’s. I’ll add the link here, let me know how it is sometime. I love your blog by the way, very slick! Lon, thanks for the link. Glad you found the notes helpful. Had a chance to check out your site…lots of great stuff, thanks. I haven’t everything here but I do think anyone who is into Rob Bell (positive or negative) should have a look at this YouTube link. I personally like a lot of Rob Bell says and own both of his books and have watched a few of the Nooma videos before. But, as we all Christ-followers we stumble. This is an example of one of Rob’s trips. The only problem is that we let pride get in the way and refuse to admit that we were wrong. Rob Bell? I just don’t get it. I’ve never had problems with being relevant, or a pharisee, or whatever the accusation that Brian McLaren, Rob Bell and the like would call me. I live in LA, and there’s more than enough trendiness around here. Rob’s got cool clothes, cool videos, and coolness coming out of every pore. I want truth, expository preaching and bible-saturated character. If you put Von Rad in Hollister and give him Starbucks, you don’t get any of those. Rob Bell strikes out. 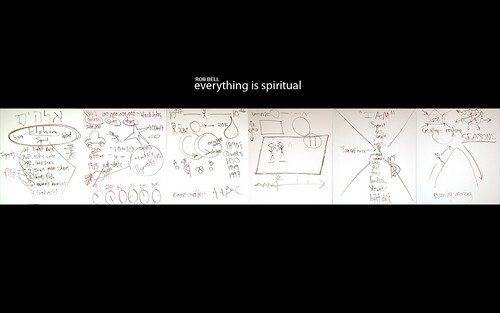 I think the music track from the DVD “Everything is Spiritual” is from the band, The Album Leaf. The song is almost a dead ringer for a song of theirs called The Outer Banks but not quite. Does anyone know the exact track? I know that The Album Leaf tours with Sigur rose frequently and that Rob is a fan of both. Contacted nooma customer service and they said it’s an independent artist who wished to remain anonymous. does anyone know what song is playing in the trailer for “the gods aren’t angry”? it’s amazing, and sounds like sigur ros, but i’ve never heard it. This is an excellent resource page on the most famous of all my overseas namesakes. what gods do yo think of. for the isea of many came from one sorce. and was ended by one. does anyone know what william parnell said at mars hill that they wouldnt play his sermon on easter sunday? Hey Rob, thanks – I was aware of it – it’s such a motherload, and I was getting so much traffic on this page every day, i didn’t want to kill the dude’s server. but yes – great stuff. Has anyone heard about Art of the Sermon? It has been “Almost Done” for a year now. Hey Jeremy, no word at all on it from what I’ve heard. I was at the live event, and it should be worth the wait. Could be because he’s working on the new ‘build your house on that’ series. I would like to show your movie “Everything is spiritual” at my church. Can you direct me to info. that gives a clear and concise description that I can share in a bulletin insert? but there are so many to download one at a time. Could we maybe collect them all in one place and upload as a torrent or something? I would be happy to keep it alive. Thanks! what an awesome resource. Thanks so much for assembling it. I’ve been listening to the Leviticus series and the link doesn’t work anymore. Any ideas??? That link works, I’ve requested access a few times and get no reply from the owner. It appears to be managed by Edward Wilson of Cedar Springs, MI, whom I’ve contacted by Facebook and Twitter to no avail. I’ve also contacted MHBC using their web form offering to pay for every week prior to 205 – 1/5/03 and have received no reply since last week. It’s amazing to me that these messages are so difficult to acquire, but I’ll keep trying. I tried as well – I cannot understand why the Leviticus series is so elusive! Any help would be appreciated!!! Thank you for your email; it is always a pleasure to hear from our on-line community! Unfortunately, we did not start recording the teachings until 2003 so the ones that are available on our website are the only teachings that we have in our possession. Hey Lon, I’m working on a Ph D dissertation and am trying to get a hold of Rob Bell’s Leviticus sermons for my work. Could you send them to me? or give me an email of someone you know who has them? Has anyone been able to get the link for mhtorah.org to work? I’m having no luck and was wondering if we could share. I would love this resource too. least to an extent the power of Jesus Christ. Christian Sermons can convict you and practically force you to come to terms with the power of Jesus Christ. bless others through me. Enoch is an excellent example of man that walked with God and was taken or interpreted. Christian Sermons hopes I’ve had and validated the answer to many prayers. Even though you love God you may very well (if not definitely) still sin but you can do the best you can to prevent temptations that lead to sin. I come from the family that preaches the Gospel and Christian Sermons are a wonderful way to spread the word of God. It is crystal clear for the Bible. The King James version is what is used as Biblical “calibration” but as long as you understand this you have come a very long way from your everyday non believer. Genuine Christian Sermons will always verify or validate this.